This wedding place card paper comes with the Escape Art Journal. I found this at Staples a while back and was happy:). Found out it was marked down even more than the sale price listed and was SUPER HAPPY! Carefully detach the label from the paper without tearing anything. Put the label paper aside. You can use it on another entry later but we're playing with the negative today:). Hate throwing away anything. Besides the "window" shape is pretty so why not use it? Flip the paper over so we get to work on the blank white side. I'm choosing to cover my with a masking technique. 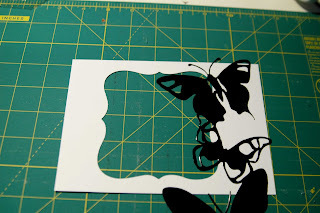 If you have some cool Heidi Swapp or Tim Holtz masks, pull them out of hiding. 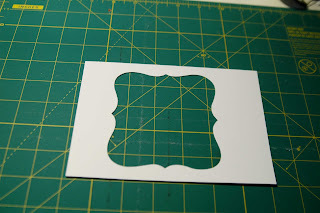 Place Heidi Swapp mask (or cut your own on large post it note) onto paper. Make sure you tack it down firmly. We made a trip out to Be Creative Rubber Stamps in Maple Ridge on Tuesday and I bought me some more Tim Holtz products. Bought these Mini Misters by Ranger. Was told by the lady who works there that I can add a few drops of TH's Distress Ink reinkers and water, mix well and spray like his Color Wash. So cool! Mix TH's Peeled Paint reinker with water in Mini Mister. 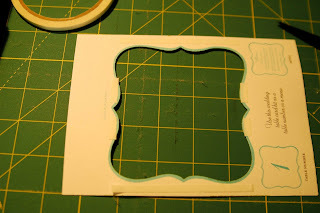 Put paper/mask piece inside box and spray randomly about 8-10 inches away from paper. I also like to use a brayer with foam attachment and pigment ink on this masking technique but was just too lazy to clean up the foam attachment afterwards. This Mini Mister technique is super quick and fun. 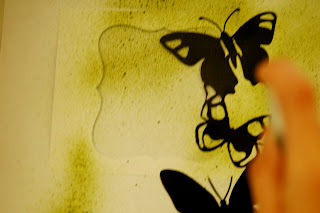 When the ink dried slightly, I removed the mask and used my heat gun to speed up the drying process a bit more. Flip paper onto its backside, add double sided tape but leave the sticker backing of tape on until you are ready to adhere it. Trim photo to fit under window opening. I used a 4x6 photo. 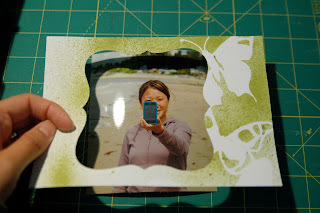 Tack paper on top of photo. 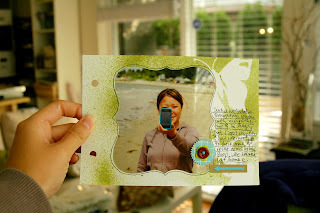 Trace around window opening with black journaling pen. 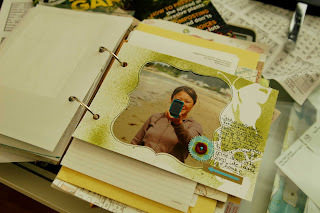 Add journaling and embellishments from kit. Punch hole on left side. Add entry into your journal:). What a fun idea, I would never have thought to use the outside part! 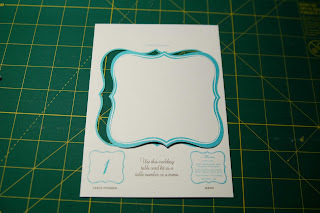 I wonder if glimmer mist would work, since I don't have any Tim Holtz products apart from a few distress ink pads. OK, guess I just need to try it out, LOL! Thanks for the tutorial. Wow, what a great idea. Soooo cute!! Love your blog, super inspirational :) loooove! Do you have a Flcikr account where we can see more of your pages? thanks for the tutorial... love how simple it is to make & it looks so beautiful. happy weekend! i looooove this idea! i got my art journal from your shop the other day and haven't had a chance to play with it yet. i am definately going to try this. love it! accidenti è proprio un'idea fantastica!!!! !